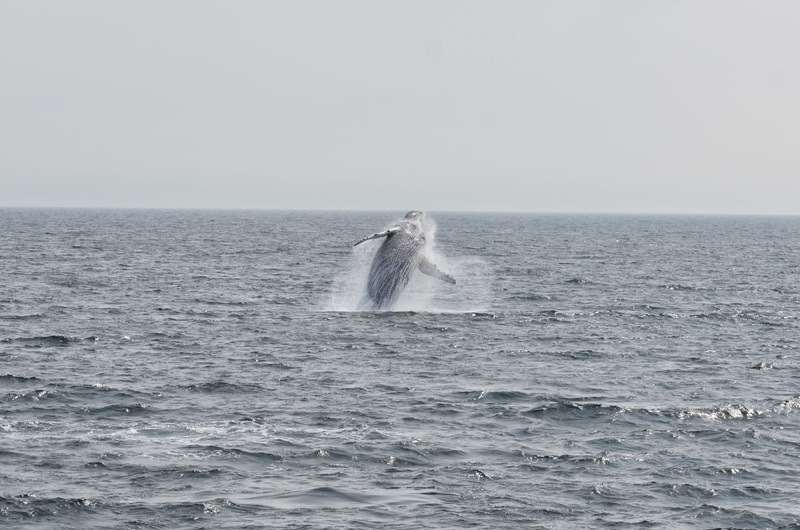 We enjoyed another beautiful whale watch on board the Aurora today! 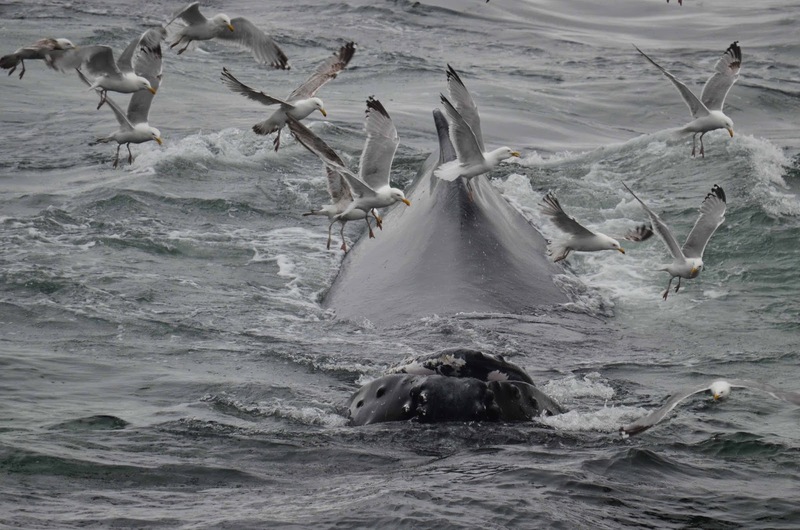 We first came across a group of four feeding whales including Orbit, Cajun, Dome and a fourth whale we suspect to have been Canine. This quartet was bubblenet feeding making huge lunges up out of the water! At one point, they corralled the sand lance towards our boat and lunged up out of the water forcing thousands and thousands of sand lance flopping up out of the water right off our bow! You can really see the fish jumping out of the whale's mouth on the right! Dozens of lucky seagulls had more than their fair share of sand lance in this one surfacing. 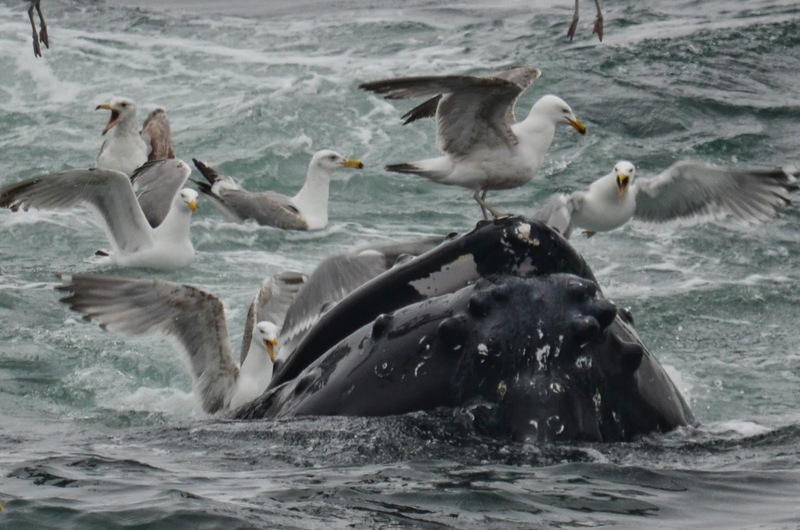 None the less, one seagull waited impatiently on a whale’s head searching for more scraps. Dome was again exhibiting unusual undulations on the surface of the water which we call snaking. 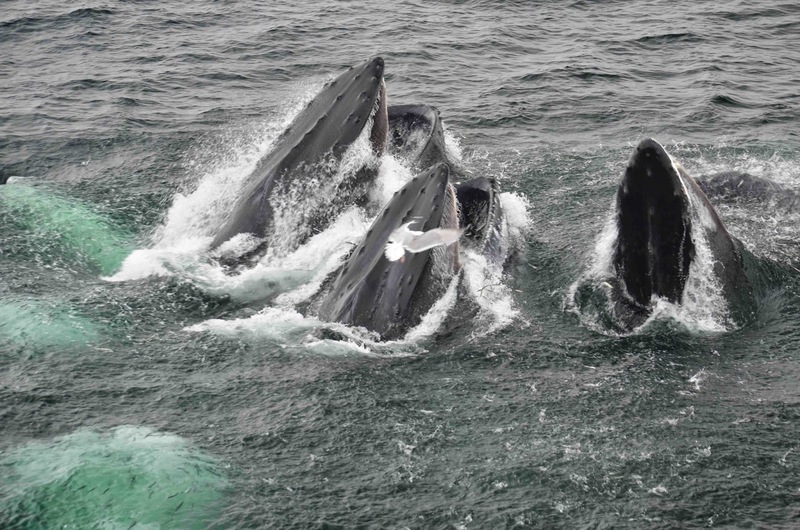 This strange movement of whales appears almost unnatural and can be quite confusing while watching. The first time I saw this behavior I thought the one whale was two different whale. 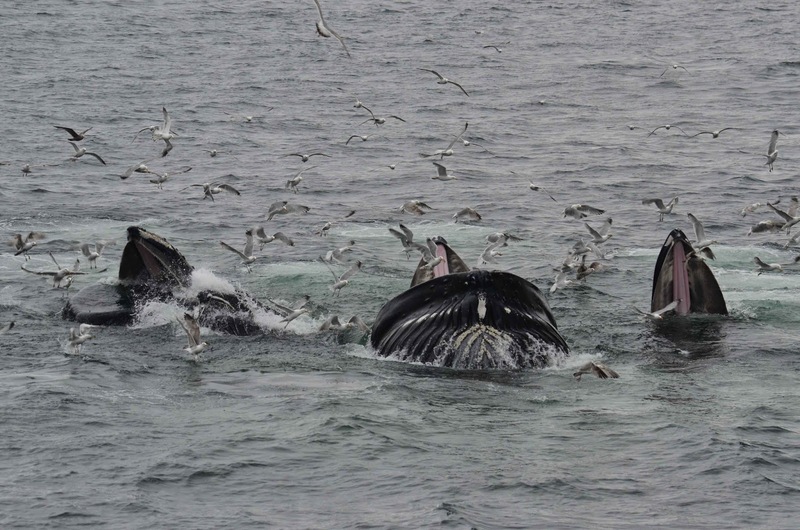 We see this behavior usually exhibited when whales are feeding as they use their bodies to manipulate the fish around them. 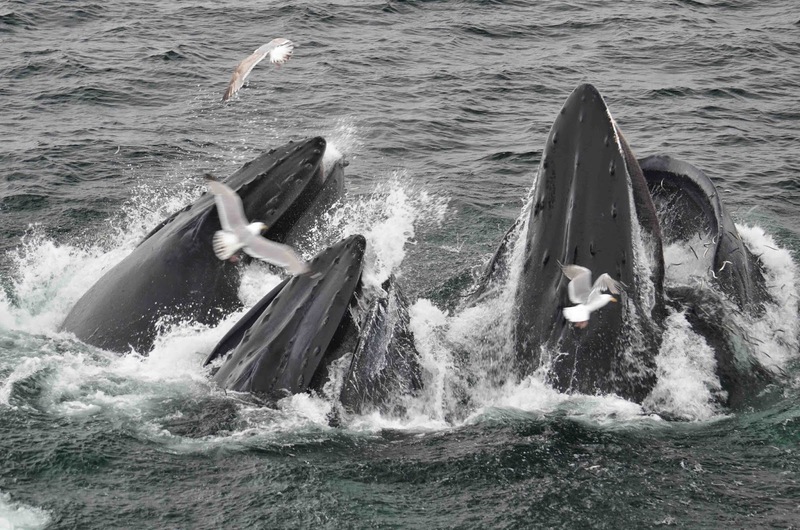 As we moved on to three additional humpbacks in the distance, we noticed that there were tons of minke whales in the area surfacing in all directions! They were definitely there to join in on the abundance of sand lance that was very obviously all around us. Glo-stick, her calf and Jabiru were the humpback whales who actually started turning and heading towards the whales we had just left as we approached the group. After watching them travel for a short time Glo-stick started her favorite feeding behavior, kick feeding! She repeatedly lifted her powerful fluke high up into the air and slammed it on the surface of the ocean stunning many fish in the process. She then made a bubble net for herself and Jabiru and continued to kick feed. On the Cetacea we headed out to the southern edge of Stellwagen Bank. Over the past couple of days the whales have been much more mobile, spending a lot of time along the southern and eastern edges of the bank. As we crossed the bank we spotted some big splashes in the distance. The splashes kept coming and we knew that we had some very active whales in the area. 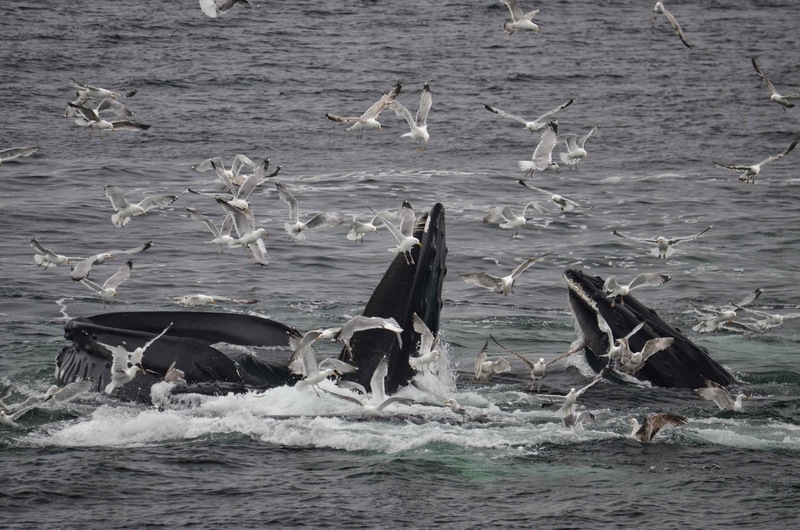 We counted at least 10 breaches as we approached the area and were very lucky that this activity continued as we got close enough to see the animals. 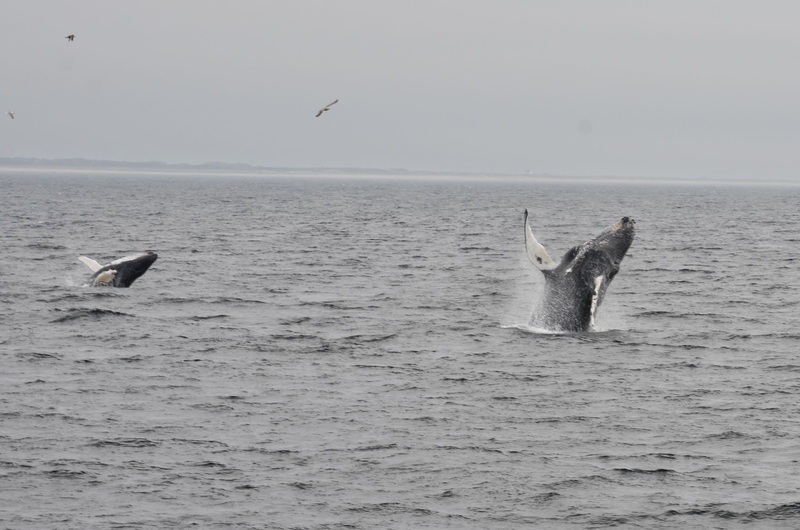 This was Tornado and calf doing simultaneous breaches and flipper slapping. 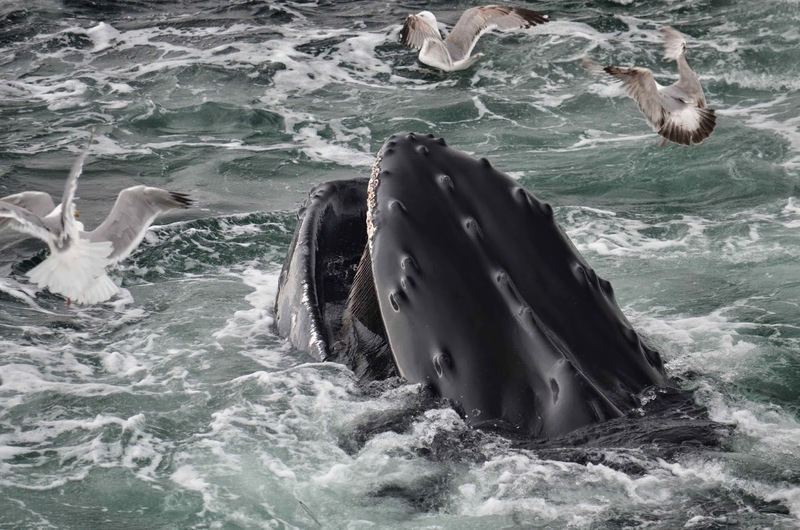 Scientists aren’t entirely sure why these animals do these behaviors but I have definitely noticed that these behaviors, breaching, flipper slapping, and lobtailing, seem to linked to each other and whales will often display multiple surface behaviors. While calf did multiple breaches and tail breaches, Tornado was a little less active but we could always guess that a breach was coming after a fluking dive. It is difficult to get good photos of adult whales breaching without a sign like this! It was a very special trip with this pair of whales.